For those who are interested in symbolism in art, especially Muslim art, the symbols of the Taj Mahal are obvious. First, let's look at the studies that have been done on the symbolism of the Taj Mahal. 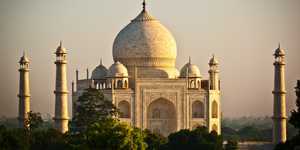 Until the middle of the 20th century the Taj Mahal has not really been studied. There are many documents, sometimes real studies on the monument, but none reaches conclusions that would be acceptable today, if we can talk about definitive results in art history. 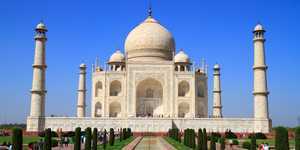 The vision that preceded the modern era was that of a Taj Mahal symbolizing love, a symbol that is still widely used today. 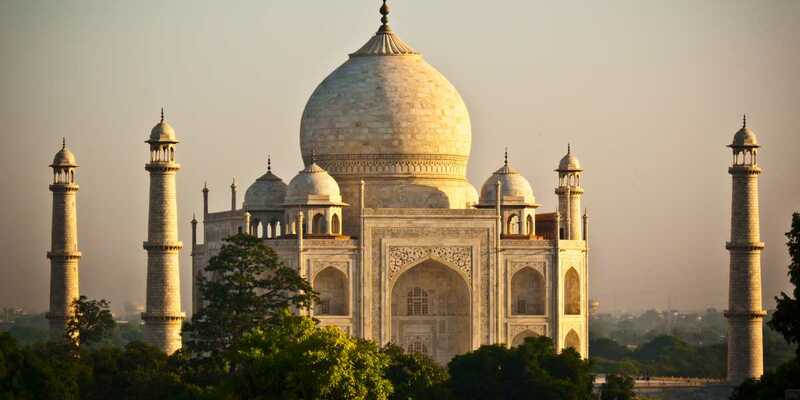 Indeed, history has left us the explanation for the construction of the Taj Mahal, namely that it is the tomb of Mumtaz Mahal, the 3rd wife of the 5th Mughal Emperor Shah Jahan. The latter built "the most beautiful tombs" for his wife died during the delivery of his 14th child. 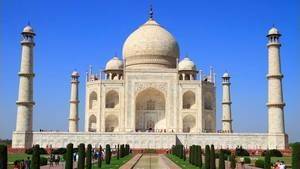 This is a historical fact, it is possible to follow the scene of the death of Mumtaz Mahal, his temporary burial during the construction of the tomb, and his final burial on the spot. When one nowadays sees the beauty of the Taj Mahal one can imagine the depth of the love that the emperor bore to his wife, and it is therefore natural that the Taj Mahal was the symbol of love. It was this vision that prevailed until the end of the twentieth century, when historians leaned a little more on the monument and discovered a different symbolism. More recent studies changed the point of view of historians. From now on, the monument is no longer a mere symbol of love but a representation of Paradise associated with the notion of Last Judgment. This vision is due to Wayne Ernest Begley, who published a comprehensive study on the subject and serves as the basis for the texts below. The Taj Mahal taken as a whole, ie including the walls, the South buildings, the gardens and the terrace, corresponds to a physical unit representing a unique symbolic message. One can not therefore exclude one of the buildings without compromising the symbolic message. 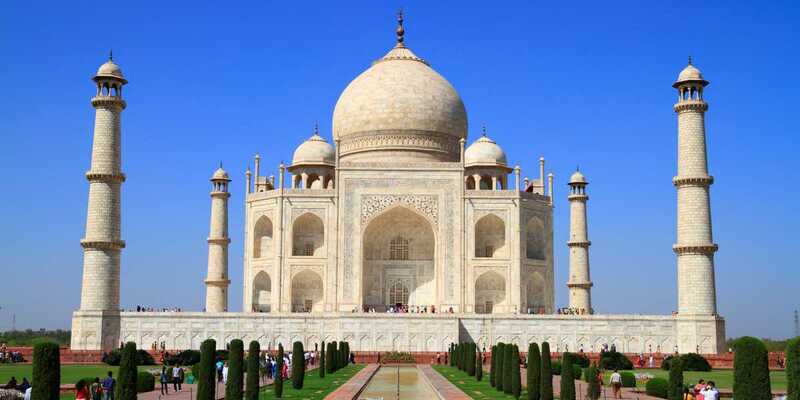 Similarly, the transformation of one of the elements that constitutes the Taj Mahal necessarily has an impact on the symbol that it represents, however small this change may be (for example, a change of material or a modification of the layout of the gardens. ). The Assembly Plain, supposed to be in place on the day of the Last Judgment, is a rectangular area surrounded on the right and left by two rows of angels and down by three rows that can be seen as the boundaries of the gardens of the Taj Mahal. The Throne of God, which is according to Islam carried by 8 angels, is on the upper part, it is represented by an 8-pointed star that is closer to the octagon of the mausoleum. He is flanked by the four righteous (The mosque and the guests' pavilion) and, just below, by the Angel Gabriel. The central basin of the plain of the Assembly is near the place where the Prophet is, who uses the scales weighing the souls of the dead. Paradise and Hell are equivalent gardens, at Taj Mahal. There is therefore an adequation, certainly imperfect, between the internal disposition of the Taj Mahal and the spiritual representation which is made of the hereafter according to the Moslem religion. The main difference lies in the fact that the gardens of the Taj Mahal are a representation of Paradise only, while the eschatological document shows on the right Paradise and on the left Hell, with the bridge allowing righteous souls to cross Hell for to access Paradise. It may be noted that the Christian religion has a similar place, the entrance of Paradise, which is supposed to welcome the dead for the weighing of souls and their redirections towards Paradise or Hell by Saint Peter, the first of the apostles. 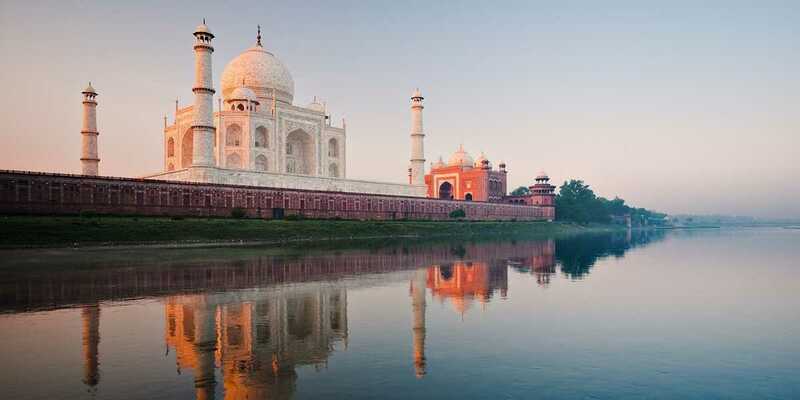 The Taj Mahal is divided into 4 parts, all aligned from South to North. Each passage from one to the other corresponds to a symbolic passage, from the most terrestrial to the most celestial. Thus the southernmost part is the caravanserai, a vast square space alas today disappeared (It was overtaken by the urbanization of Agra) which hosted a market and where caravans from other cities arrived. It was a meeting place, trade and cultural exchange, a place dedicated to earthly life without any reference to spirituality. Further north is the inner courtyard, named Jilaukhana, which is a place of preparation for spiritual life. Symbolically this is the place where people from outside prepare to enter the holiest places of the monument, a place where are the graves of the first two wives of Emperor Shah Jahan and where the officiant resided religious, at the time. Then, further north, the visitor passes under the main door, Darwaza-i rauza. This door (In fact, a very impressive building) corresponds to the passage from life to spiritual life since it allows to enter Paradise, represented on Earth by a garden. The latter responds to a scheduling explained below. Finally, to the north, there is the mausoleum, the most sacred part of the Taj Mahal. It is guarded by a mosque and the guest house, a building similar to the mosque but not consecrated because it is not oriented in the right direction. This path has been studied by the builders and this representation of Paradise is proved by a large number of elements. In all the Taj Mahal the number 4 is represented everywhere, it is a common number in the Koran. It divides into equal parts, has several geometric representations and is associated with logic, rigor, as many characteristics sought by the Mughal builders. These are the 4 most obvious channels, they divide the garden into 4 parts, themselves divided into 4. The garden is a perfect square, as is the central basin. The mausoleum is flanked by four minarets, its four-domed roof surrounding the main dome and is octagonal in shape with four long sides and four small ones. The garden consists of two long channels oriented along the cardinal points, they form a cross. In the center of the cross, the canals do not join, the center being occupied by a square basin. The 4 channels symbolize the 4 rivers of Paradise according to Muslims, namely the river of water, that of milk, that of wine and that of honey. This description is made in sura 47, verse 15 of the Qur'an. 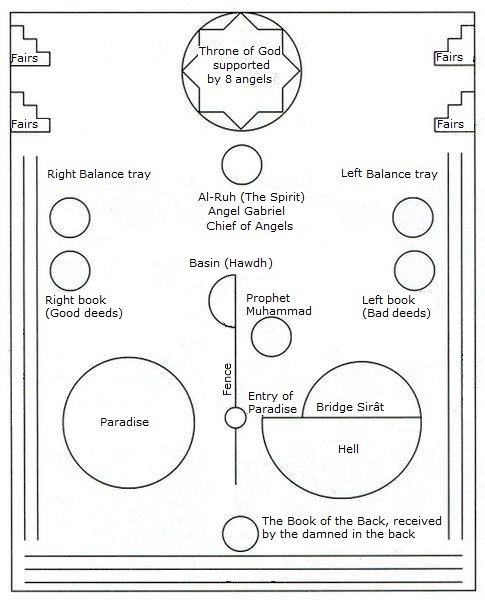 Geometrically the 4 channels divide the garden into 4 equal parts, this is another Koranic representation, that of Surah 55, verses 46 to 50 and 62 to 66: The 4 gardens of Paradise. The central basin, it is a representation of the possibility for the deceased to refresh. Like all 3 religions of the Book, Islam evokes the ascent of souls in Paradise. Thus we find in the Taj Mahal this notion of ascension, and it is probably the religious notion most shared with Catholicism and Judaism. It is found in several places: The shape of the dome, the elevation of the minarets, and the position of the terrace. The terrace is accessed by a hidden staircase, when viewed from the entrance of the monument. So far, the mausoleum seems to float in the air without constraints. As its architecture is of a great lightness this sensation of floating is accentuated. In addition the mausoleum is surmounted by a bulbous dome characteristic of Mughal art, the dome points to the sky and further enlarges the elevation of the mausoleum. What does not necessarily see the visitor is the symbolism that is attached to the forms: The mausoleum, octagonal, is on a square base, a geometric form associated with the earth. We must know that according to Muslims, we speak not of one but of 8 paradises. It is easy to get between these 8 paradises and the octagon of the mausoleum, and we have a chain: Square to octagon to dome, which symbolically represents the passage from the earth to Paradise. According to the Qur'an, four angels support the divine throne, and they will be eight on the Day of Judgment (Sura 69, verse 17). The 4 minarets are a direct reference to the ascension of souls to the sky. They surround the mausoleum whose dome has the same function and seem to help it, make it the passage to Heavenly Paradise. In that their finesse is an asset, they counterbalance the mausoleum, much more massive whatever air enough for such volume. Finally, the dome has an obvious function of representing the ascension of the soul of the deceased towards Paradise. The lotus is a symbolic flower from the Hindu tradition, it is one of the elements proving the mix of culture of the Mughals. In the Hindu imaginary it represents the knowledge, the opening on the world and in a more spiritual way the uniform and continual widening of the universe. This is due to its ability to deploy when in the water, Hindus believing that it has the opportunity to open to the world for it may be in a conducive environment, a metaphor for life on earth . The materials used to build the Taj Mahal are not neutral, they were certainly dictated by practical constraints, but not only. 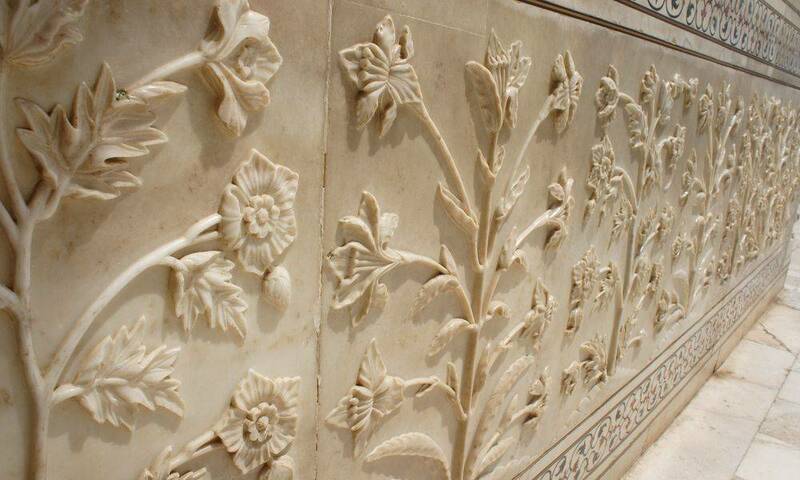 So white marble was used to highlight the brightness of the mausoleum. Of a good whiteness, the mausoleum always appears illuminated whatever the quality or the color of the light. In the Qur'an we speak of "Pearl of Paradise" to evoke holy places. A pearl of Paradise can be, logically, coated with white accentuating the transparency of the place. This brilliant whiteness at any time of the day is never interrupted in shadows because the iwans (Persian-inspired porches carved around the mausoleum) are wide, high and shallow, shadows can form there do not alter the brightness of the monument. In addition, the colors provided by the morning or evening sun, depending on the climatic environment, leave the mausoleum just as bright. Muslims can then compare it to what is inscribed in verse 35 of the 24th Sura "light of heaven and earth". The color of the materials is also important for the Hindu symbolism. The Taj Mahal is essentially white and red (white marble, red sandstone). 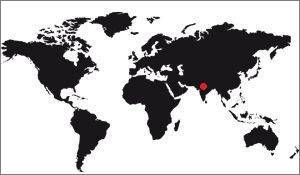 In the Hindu civilization red is the color of warriors while white is that of Brahmans. Brahmins are literate men, teachers or priests. to use the colors red and white is therefore, vis-à-vis the Hindu community, to highlight the duality Earth-Sky by evoking their representatives on Earth. The mausoleum is covered with floral or plant decorations that are of two types: Either in Pietra dura (ie in stone marquetry), or in low relief. The use of bas-relief rather than high relief (whose relief is more accentuated) is justified by the limitation of the game of shadows it will cause on the monument itself, the goal being to leave the mausoleum the sunniest possible. Why flowers and plants, not animal or human representations? The answer is also purely symbolic. In Islam, all human representation is prohibited, so there is none. Then, plants represent well-being because Islam has developed in arid regions, water, plants were therefore precious goods and as all that is valuable is logically associated with the afterlife , plants are in a good place in the list of divine elements. Moreover, the garden is a representation of Paradise, it is totally related to the representation of plants on the mausoleum, these plants evoking the eternal paradise life. The flowers have even more this notion of paradisiacal plants since they do not have terrestrial vocations, the fruits, being nutritious they are closer to the terrestrial life. 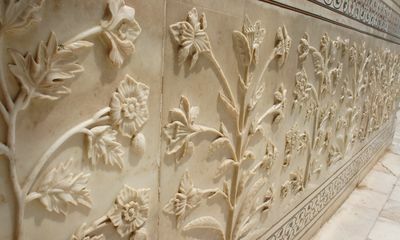 The floral decorations thus participate in the representation of the Paradise that is the Taj Mahal. The mausoleum has, externally, various symbolic notions: Bright white color, octagonal shape reminiscent of the 8 paradises, dome stretching towards the sky. But its interior is also symbolic. Access to the central part containing the cenotaphs can only be done through anti-chambers corresponding to a final purification of the soul before the arrival to the holiest places of the Taj Mahal. This passage is identical to what can be done when the visitor enters the gardens. The center piece, also octagonal, has 4 passages opening on the 4 cardinal points. The perfect orientation of the mausoleum is closer to the Paradise vision of the Mughals, who focused on geometric precision. Thus, in the mausoleum, the notion of space is lost since everything is perfectly identical, the visitor being in a place without spatial reference, which increases his impression of being in Paradise. The exceptional acoustics of the mausoleum is also a symbol of purity. The sound spreads by bouncing on the walls without being stopped, reflected until the loss of power that marks its end. It can hold 30 seconds. The Yamuna River that runs through Agra City runs just north of the resort. This river is a tributary of the Ganges which is the purifying stream of Hindus. It is in the Ganges that the ashes of the Hindu are dispersed because the river is what purifies the soul of the deceased before the continuation of its course towards the sky. 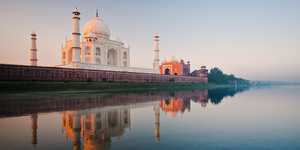 The proximity of the tributary of the Ganges with the Taj Mahal is therefore a symbol of the Mughal's desire to purify the soul of the late Mumtaz Mahal, and that vis-à-vis the Hindu community rather than Muslim. For information according to Hinduism Ganges is a sacred river coming from the foot of Vishnu and joining Mount Meru which is the cosmic mountain, the axis of the universe. In conclusion we can say that the Taj Mahal was built according to standards imposed by religious imperatives centered on the concept of life after death. If Islam is the main source of inspiration, Hinduism has not been forgotten with, for example, the use of stone decorations and purification of the soul by the Yamuna.